Birmingham Council Case Study | Eptica - Multi Channel Customer Interaction Software. Email Management. Web Self-service. Live Chat and Agent Knowledgebase. 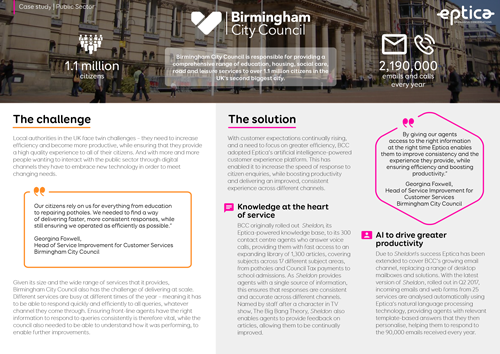 Birmingham City Council is delivering improved service to its 1.1 million citizens by using Eptica’s artificial intelligence-powered customer experience platform to respond consistently to the over 2.19 million emails and phone calls it handles every year.